A solid construction made from 4 mm thick marine grade aluminium panels combined with aircraft grade billet aluminium cross members. Beautifully machined to tight tolerances. Solid connection to headstock with 2 billet machined clamps, no welding or drilling required. 100% Bolt-on construction, tested under extreme conditions. All fasteners in stainless steel, all aluminium parts anodised in black for extra protection. 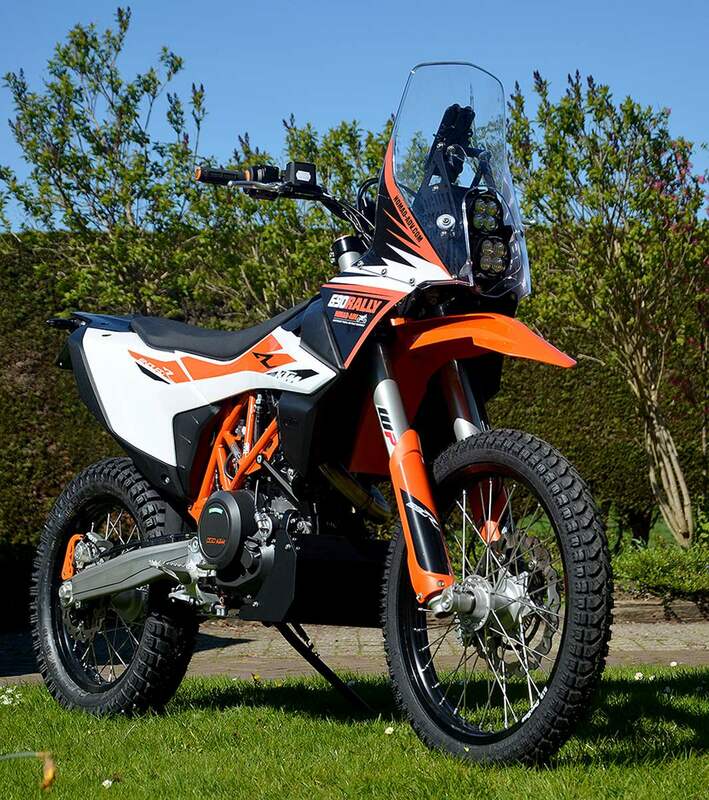 The frame of the new 690 is of a similar design to the 701, but not the same! The Nomad-ADV tower is in essence the same design as for the previous model too although not a lot of parts are the same. New clamps, a new tower, new side panels and even the dash panel is all new. It’s an all bolted construction, which means repairs can be made. It’s all aluminium too, with rounded edges to create not only a solid construction but also a safe one in a crash. Carbon Fibre might be the magic word at the moment, and can be very strong when each layer has bonded perfectly to the previous one (which you can’t see from the outside) but in reality it gives a tower which will shatter on impact and becomes a meat processor with it’s sharp serrated edges. And we don’t do ‘brackets designed to bend’ either. Our tower is strong enough for a 100kg person to hang on it, I know as I’ve done it…! 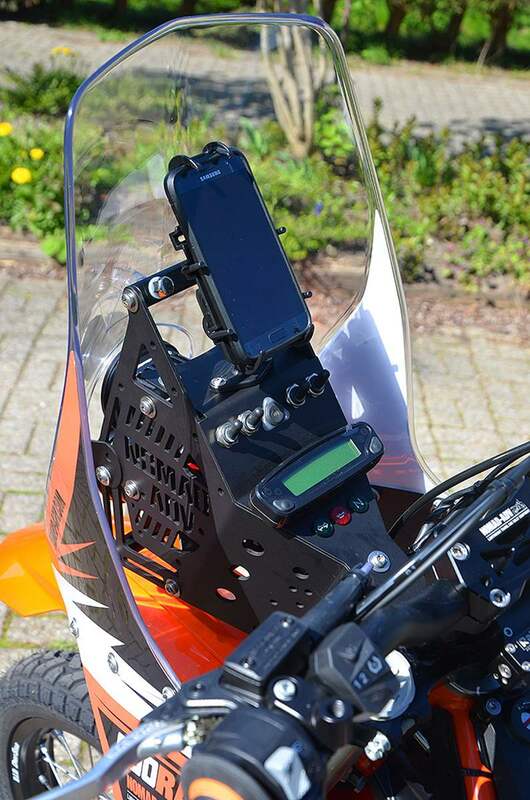 The navigation tower can be used for travel or rally, or both as we have a new quick release system for our rally kit which can hold a Roadbook, Tripy, ICO and/or RNS trip meters. We also have holders for Iritrack and Sentinel professional rally equipment Dakar inspired design Wind protection is provided by an original KTM 450RR Rally screen, designed in a wind tunnel and tested in the Dakar at speeds of up to 170 km/hr! Well over the requirements of true travellers perhaps but a testimony to how good these screens are. They have round edges all round and are very hard to break. 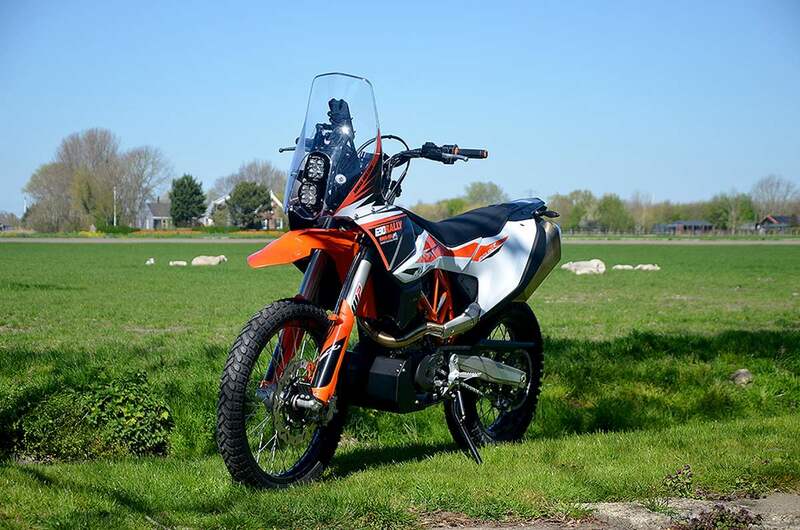 Not only a very good and tested screen, but also widely available from every KTM dealer and for a realistic price, which fits in with our philosophy to make a kit which is safe and can be repaired easily when on the road. Proven construction In contrast to other offerings, the Nomad tower is complete. Ready for fitment to the bike straight out of the box, nothing more to pay. It bolts to the bike, no welding required. The wiring is neatly enclosed inside the tower, using the original wiring loom and using the same methods for fitment as used in helicopters to ensure the wiring doesn't get chafed in rough terrain. For items like a GPS, satellite tracker, Go-Pro etc. we have made provisions for up to 5 RAM mounts. The tower can accommodate up to 12 (yes twelve!) USB charging points or a combination of USB and standard 12V connections. 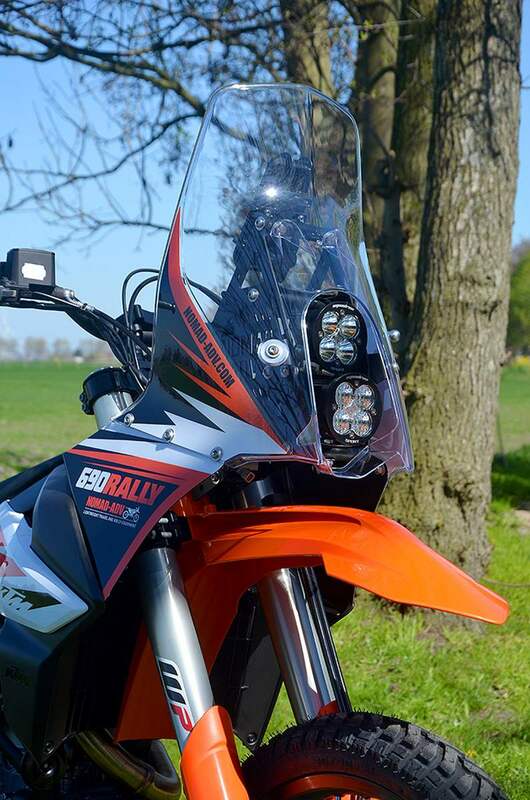 The switches are extreme heavy duty, rain waterproof and don't need external relays to operate items like spotlights, fog lights, heated vests, heated grips etc. There are 4 holes pre-cut for the switches.